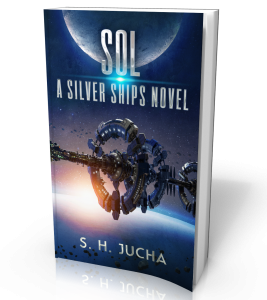 “Sol”, the fifth book in the Silver Ships series, will be released on Amazon on July 1st. For the fans out there, “Sol” concludes the story started in the fourth book, “Haraken”. Alex and company have chosen to preempt United Earth by showing up at Sol before the Earthers send their fleet to the Confederation. To those that have asked the question, “Are more books planned for this series?” The answer is yes. At least three more novels and a short story, following “Sol” are in the planning stage. This entry was posted in Readers, Uncategorized on May 16, 2016 by Scott Jucha.